This is one of those awards that dovetails with my personal vision as a writer, honoring books that "promote cooperation and cultivate an awareness of our diverse cultures." 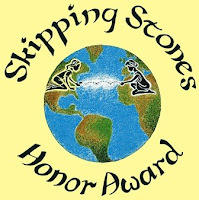 Thank you, Skipping Stones! Here's the full list of multicultural and international awareness honor books. Download this .pdf to see the list of nature and ecology books. Reviews of all the books are in the magazine's Summer 2009 issue. 52 Days by Camel by Lawrie Raskin with Debora Pearson. Annick Press. Ages 9-13. A Boy Named Beckoning by Gina Capaldi. Carolrhoda Books.Ages 8-12. As Good as Anybody by Richard Michelson, illustrated by Raul Colón. Alfred Knopf. Ages 6-10. A is for Abraham by Richard Michelson, illustrated by Ron Mazellan. Sleeping Bear Press. Elementary grades. Baila, Nana, Baila/Dance, Nana, Dance retold by Joe Hayes, illustrated by Mauricio T. Sayago. Cinco Puntos. Middle grades. Ethiopian Voices: Tsion’s Life by Stacy Bellward, photographs by Erlend Berge. Amharickids. Ages 6-11. Extraordinary Women from the Muslim World by Natalie Maydell and Sep Riahi, illustrated by Heba Amin. Global Content Ventures. Ages 9-13. I Am Barack Obama by Charisse Carney-Nunes, illustrated by Ann Marie Williams. BrandNu Words. Ages 6-10. Pitch Black, a graphic novel by Youme Landowne and Anthony Horton. Cinco Puntos. Ages 13-17. Lana’s Lakota Moons by Virginia Driving Hawk Sneve. Univ. of Nebraska Press. Ages 12 and up. The Latehomecomer by Kao Kalia Yang. Coffee House Press. Ages 14 and up. Secret Keeper by Mitali Perkins. Delacorte Press. Ages 12 and up. The Storyteller’s Candle by Lucia Gonzalez, illustr. Lulu Delacre. Children’s Book Press. Ages 6 and up. Grandfather’s Story Cloth by Linda Gerdner and Sarah Langford, illustrated by Stuart Loughridge. Shen’s Books. Ages 4-9.